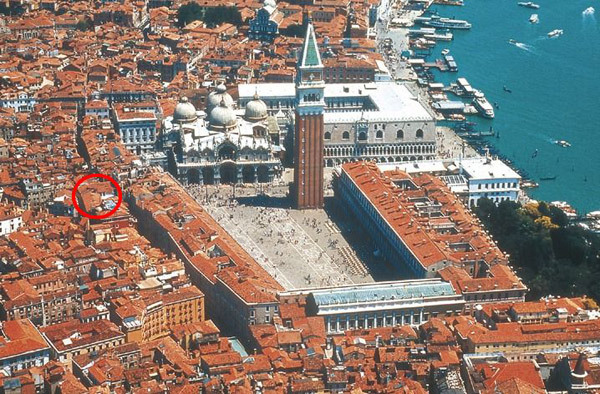 "Suites Torre dell'Orologio" is situated in a central position, at the entrance to St. Marks Square, along the famous shopping area "Mercerie dell'Orologio". Once in St. Mark's Square all you need to do is walk under the Clock Tower and take the second "Calle" (pathway) on the left. We are by the canal. Transportation to and from the airport Marco Polo may be organized either by private water taxi (departing/arriving from Piazza San Marco) or by “ALI LAGUNA”, regular and fast shuttle boat service. At the end of the motorway, exit Venezia, follow the indications for Piazzale Roma, where you will find the car terminal (24 hour parking): From here you may take either a private water taxi or public transportation. Outside the railway station “Venezia Santa Lucia”, you will find both private water taxi or public transportation. The docking area for private yachts is along the Riva martiri and for cruises the maritime station San Basilio. From either landmarks you may take private water taxi or public transportation. From either Piazzale Roma (car terminal) or from Venezia Santa Lucia train station, you need to take the “Vaporetto” (water buses) lines N. 1 (local) or N. 82 (express), direction San Marco and stop at “San Marco – Vallaresso”.